My roofing project took a leap forward this week. Yes, I found a sale on architectural shingles that lasted only through this weekend. I spent way more time on the roof project this weekend than I intended. 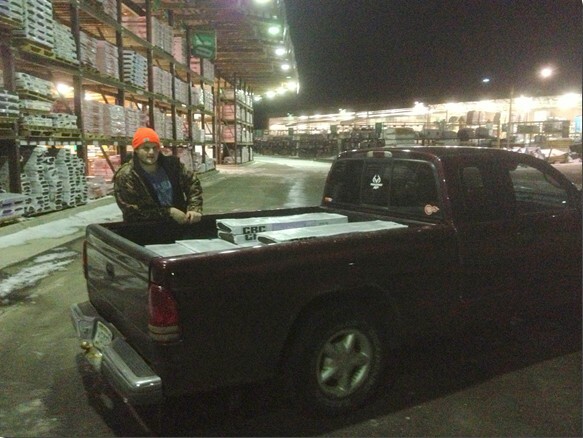 As you can see, our Wade helped me load up the five dozen bundles of shingles and get them safely tucked away until May. Here's the week 9 version of my weekly goal updates for 2013. I'm posting late this evening because I literally have been cramming to the deadline. I'm weary today, almost wasted really, but I feel great about week nine! Seems to me that the accomplishments I'm most pleased with in my life have come with some serious discomfort. You might guess from the photo that my roofing project took a leap forward this week. Yes, I found a sale on architectural shingles that lasted only through this weekend. Well, that's what I worked all that overtime for in the fall. I spent way more time on the roof project this weekend than I intended. As you can see, our Wade helped me load up the five dozen bundles of shingles and get them safely tucked away until May. January, check. February, check. Sitter lined up for March 16th, check! Yes, Colleen and I are anticipating a few hours to enjoy Iozzo's Italian Restaurant, and then some leisurely perusing of Barnes & Noble Books in Rib Mountain. Plans are set! Hey, it's a 2 pound week! Haven't had one of those for a while. So I'm down 19 pounds and still just 3 pounds behind pace for the May 6 goal. Colleen, Jason and I have been hitting the YMCA quite a bit: basketball, track, swimming, and some billiards and foosball. Jason put on his snow pants this week and he was doing the whole "pants on the ground" thing 'cause he's too skinny to keep them up. I'm two months and a day from my goal date. Can I lose 18 pounds in that time? I'm not sure, but I'm still dialed in. My goal pace stays at 2 pounds/week. This goal took a back seat this week. Since the roofing project is so nicely ahead of schedule, I'll get back to taxes this week. The goal remains to finish and submit taxes by next Tuesday. I'm thrilled to say that the "Kids Change Everything" chapter is done! First draft anyway. So know I'm on to section three of the book. This starts with circling back to Core Value Five. My two week deadline is to finish "CV5 ~ Personal Management: Everything For God's Glory." The roof project stole the show this week. With a garage full of shingles, I'll just try to knock out a few small details in the project plan this week. I'll be contacting family members about workable dates for the roofing weekend. I've got a couple of tool details to look into, and I'll stop by Menards weekly now to watch for sale items on my materials list. This is how the work is done, folks! It's week by week focus on the overall plan. Do you remember when we talked about our lives changing forever by midnight just by getting on the path? Well, this is the path and I'm staying on it!